George Graham Reviews Keller Williams' "Laugh"
Music critics like to categorize performers, in fact many feel it's their job, helping music fans relate to someone new by comparing their music to something familiar. But for me, it's nice when an artist or group slips through the cracks and makes music that requires a lot of hyphens to describe. Keller Williams is someone whose music defies quick categorization, but whose component stylistic ingredients are pleasingly familiar. He has just released his sixth album called Laugh. Virginia resident Keller Williams is a largely self-taught guitarist who has a distinctive rhythmic or even percussive sound on his instrument, playing primarily on acoustic guitar. He is also a singer-songwriter who writes lyrics that are not exactly standard thoughtful introspective folkie material -- his words are sometimes humorous or even semi-nonsensical. And to that, he often gets into a jam-band mode with his regular group. He also previously recorded a CD with one of the world's best jam bands, the String Cheese Incident, for whose record label Williams records. Partly on the strength of his association with String Cheese, he has been winning more and more fans. But this new CD features his own band, just a trio with bassist Tye North formerly of the bluegrass jam band Leftover Salmon, and drummer-percussionist Dave Watts. Together they create a generous CD that covers a fairly broad range, while living up to the implications of the album's name, with music that is often lighthearted, frequently interesting musically, and often surprising danceable. Williams is an appealing vocalist whose tongue-in-cheek lyrics can be delivered in the properly wry manner, and his band is both sympathetic and rather eclectic, especially drummer Watts, whose often plays with brushes, does hand-percussion, and even resorts to mouth percussion sounds to add some variety. Williams has a characteristic style that is heard most frequently on the CD, with a sort of upbeat, driving rather funky beat. But he and the band can do more laid-back material, venture into reggae influence, even get a little jazzy on one track, and veer off into bluegrass on another. There are also three instrumentals, plus a long jam at the end of the CD. While most of the album consists of just the trio, in many cases playing essentially live with no apparent overdubs, there are a few guests, including some horn players and as well as a fiddler and mandolinist appearing as guests. This CD also has some cover tunes from unexpected sources, including Ani DiFranco and the late guitar virtuoso Michael Hedges, whose influence on Williams can sometimes be heard. Guitarist, singer-songwriter and jam-meister Keller Williams, on his new sixth album, Laugh, which like all its predecessors carries a one-word title, is an enjoyable, and quite entertaining recording marked by tasteful, and frequently impressive musicianship, clever lyrics and a broad stylistic amalgam. Even with a only a three-piece band and Williams on his acoustic guitar, the music can sound much bigger, thanks to the energetic playing of Williams and his band. Williams' strong, rhythmically-driving guitar style recalls that of the late Michael Hedges, and his music can occasionally resemble that of his friends with whom he has recorded in the past, The String Cheese Incident. But the way Williams blends these ingredients gives his music a distinctive sound that is not easy to lump in any pat genre. Our grade for sonic quality is about an "A minus." In general the recording is well done, with good clarity and not too much studio gimmickry, but the sound is pumped up a bit restricting the dynamic range. There seems to be a group of artists who combine first-rate instrumentalizing, or jamming, with clever lyrics, including the members of Phish, Col. Bruce Hampton, and going back to Frank Zappa and some of the British groups like Hatfield and the North. 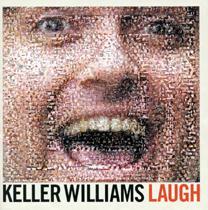 Keller Williams continues that line on his new CD, and makes music that's both interesting and fun.